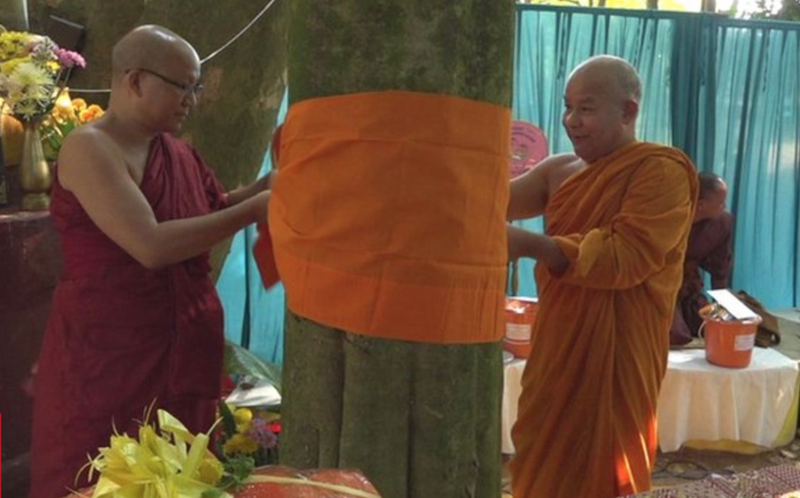 In Thailand, head monks have been travelling all over the country giving full priest ordination ceremonies to old growth trees, turning the trees into full-blown priests. They are dressing the trees in saffron ribbon and robes so that anyone who walks past the tree has to stop and bow because not only is the tree a sentient being, it is also a priest. A Buddhist monk from north-east Thailand is so worried about the environment that he has been ordaining trees for 25 years.Since 1990 Phrakru Pitak Nanthakthun has been leading ceremonies to dress trees in orange robes as a way of convincing people that they should be viewed as sacred. Phraku Pitak believes the symbolic act can help prevent the logging and deforestation that plague his home province of Nan. The movement has spread across South-East Asia as more and more people become concerned about the effects of deforestation on the planet and our environment.